As a saddle manufacturer, Fizik belongs to the new guard of companies that have challenged Selle Italia and Selle San Marco in the premium saddle demographic since the 1990s. While some companies such as Specialized and Bontrager (a Trek house brand) have marketed saddles as a way of making sure to get the biggest piece of the pie when it comes to complete bike sales, Fizik as brand began as a saddle maker first and foremost. With the backing of parent company Selle Royal, the Fizik brought a fresh approach to saddles in both shape and materials. Their designs have been hugely influential to the market, and several of their designs, such as the Arione, have become icons already. Fizik also became well known for their handlebar wrap, allowing both professional teams and aesthetically-minded riders to colour-coordinate their saddles and bars. A few years ago Fizik launched a shoe line, which honestly is a really tough market to enter. There is no shortage of shoemakers pushing the envelop of style and technology. As an industry observer, I am curious to see how that move pans out for Fizik in the long run. On the other hand, Fizik’s line of elegantly engineered “Cyrano” seatposts surely deserve more appreciation, though the low market profile can partially be attributed to the current fashion of proprietary seatposts on high-end carbon frames. Yet most recently Fizik debuted a line of handlebars that incorporate the same fit/positioning concepts as their saddles in a full line of dropbars for the road. In a manner similar to their spectrum of 3 saddles to fit different styles of riders, the handlebars are available in three basic bends, each with several levels of construction (eg carbon, aluminium). For a first look at the bars, go here for my earlier writeup. If a company is going to make handlebars and seatposts, clearly they should be making stems as well. Thus, the Cyrano stem. Currently there is only one level of construction, R1. In Fizik’s product-speak, the “R1” designation is reserved for upper-mid range goods. This is supposed to be a pretty nice stem. And by all accounts it is. The Cyrano stem is made from 7075 T6 aluminium with titanium M5 handlebar and steerer clamp bolts. The stem’s body appears to be a near-net forging, and the walls of the extension are quite thin compared to your run-of-the-mill aluminium stem. The extension has a squarish cross-section that sets it apart from other high quality stems with circular (eg FSA OS-99, 3T ARX) or oval (Deda Zero100) sections, though having four bolts securing the faceplate is completely typical. The bolts of the faceplate are neither widely spaced (like the original 3T ARX) nor tight (like Ritchey’s WCS or the new ARX II), and 40mm stack height for the steerer clamp is almost a standard for stems of this class. However, the Cyrano stem is very uncommon in one subtle aspect: the handlebar clamp bolts angle distinctly where they thread into the stem, as opposed to all the bolts having paths parallel to the stem extension. 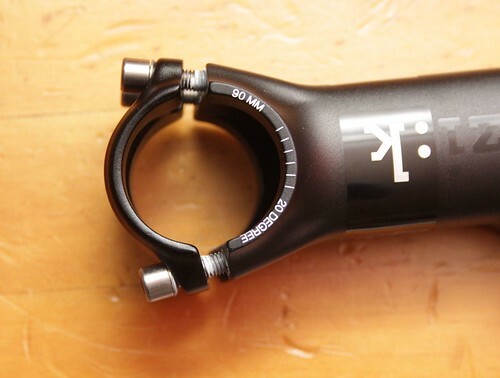 The Ritchey C260 also has angled bolts employed to accommodate the 260 degrees of bar circumference that the extension’s portion of the clamp provides. In contrast, on the Cyrano stem both the extension and faceplate contact an equal, almost 180 degree portion of the handlebar circumference. 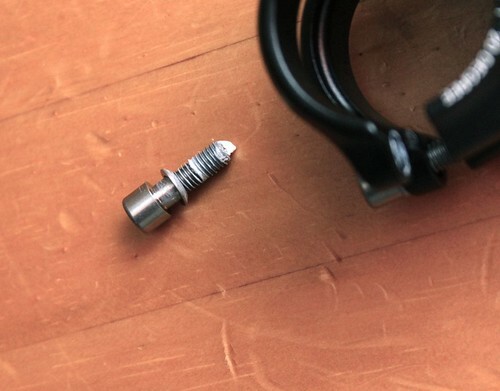 Reflecting a recent trend in bicycle components, the Cyrano’s titanium bolts require a T25 driver. When small bolts are made not in steel but in softer alloys such titanium and aluminium, Torx heads are probably a smart idea. However, a Torx head doesn’t make stripping the bolt impossible. Personally, I have never stripped a titanium stem bolt nor do I frequently alter the position of my stem. My main worry is being out on the road when something unexpected comes up and I find I need but don’t have the right bloody tool. Everyone else out there bemoaning the insidious Torx incursion may as well get used to it too, because Torx isn’t going away. Looking at the Cyrano’s particular bolts, you’ll see that each one, steerer or handlebar clamp, has a small, convex washer to help align forces on the bolt head. The washer is NOT captive on the bolts, and I’ve never seen any parts catalog listing such a item. The moral of this story is DON”T loose those little effing washers when you back the faceplate bolts all the way out to fit the bar in; you’d be screwed. The Cyrano R1 stem is available in lengths 70-130mm in either +/-7 or +/-20 degree options (the 70mm length is 7 degree only). At the moment, the majority of high-end stems come in 6-8 degree versions, with a few offering a +/-17 degree version. Since high-end road bike evolution has centered on monocoque carbon frames with stock geometry, a large percentage of riders will need the bigger angle stems to achieve the position they need, be it higher or lower than typical. 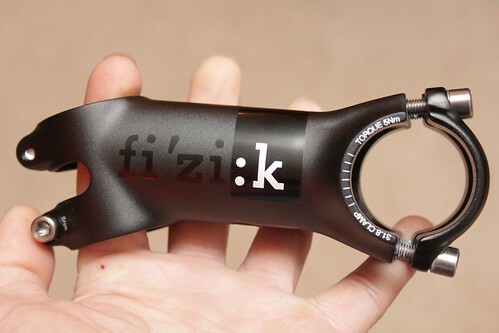 Knowing that stem is intended to be used angled up or down, Fizik prints their logo on the side of the stem’s extension such that the logo is always right-side up when viewed from the drive side of the bike. Of course, that means it’s always up-side down on the left side, but whatever. The logo could be described as discreet and low key, if one considers the typically garish norm. The Cyrano’s black finish contrasts polished panels against the overall bead-blast matte finish, which gives a classy look that subtly compliments a wide variety of bike finishes. The Cyrano in a 90mm length/20 degree stem weighs 121gr, which is comparable to similar high-end stems (sidenote: 17-20 degree stems weigh a skosh more than their 6-8 degree counterparts) . It is not easy to find a stem lighter than that, nor is it necessarily a good idea when it is such a critical component. At about US$110-120 retail, the R1 Cyrano stem is targeted at the high-end, similar to offerings from FSA, Deda, 3T, etc. When it comes down to it, designing a lightweight, dependable, stiff, and strong stem isn’t rocket science, but it certainly isn’t easy to do cheap. The materials and the manufacturing techniques are just expensive. Still, as I have mentioned, there are a lot of other stems out on the market that meet those qualifications…what sets the Cyrano R1 apart? First, fit. 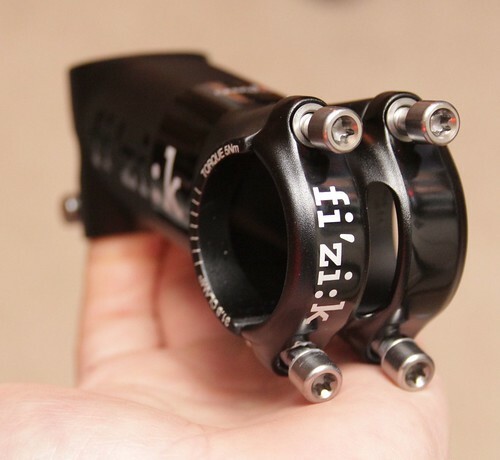 With 7 or 20 degree versions, Fizik gives riders just a tiny bit more vertical range than the others. Second, aesthetics. Such issues are always open to personal opinions, but the Cyrano is neither too flash nor too banal. Third, a Cyrano stem can be matched to a superb saddle, handlebar, seatpost, and bar wrap from Fizik as well. Don’t get the Cyrano if you are allergic to Torx (and if you are, better stock up on Allegra because Torx ain’t going away).